It’s hard to keep a secret – especially if that secret is a new product collaboration between Sonos, one of the largest and most well-known audio manufacturers in the world, and Amazon, a company that needs no introduction. The fruit of that collaboration is a still unannounced smart speaker that has the brains of Amazon’s Alexa and the audio brawn of a Sonos Play:1 speaker. And while the speaker has yet to be publicly recognized by either party, pictures of a sample unit have already started to make their way around the internet. Photos popped up Monday on Caschys Blog, a technology enthusiast website run by blogger Carsten Knobloch. Knobloch says the pictures were submitted anonymously by a reader who claimed to receive a unit ahead of its unveiling. Unfortunately, hours after the article was posted, it was mysteriously taken down ... but not before sites like The Verge and others grabbed a photo of it. While it’s possible that someone is trying to stir up some trouble with a doctored image, the pictured speaker does match the description of Sonos’ FCC filing right down to the interface – the FCC filing had the same exact play / pause button and microphone icons in the same layout as this leaked device. So what’s one to make of all this? 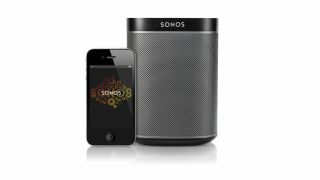 Sonos definitely has a new speaker coming out and this, very likely, is it. We'll reach out to Sonos to learn more about the potential smart speaker and will update this article when we learn more.